If you are looking for a gift for someone special, December’s trio of blue birthstones offers a wide range for every taste, style and personality – even if it’s not their birth month. Let’s suppose, just for fun, that gemstones have personalities. Let’s look at the traits of turquoise, zircon and tanzanite to pair them with different individuals for the perfect gift. 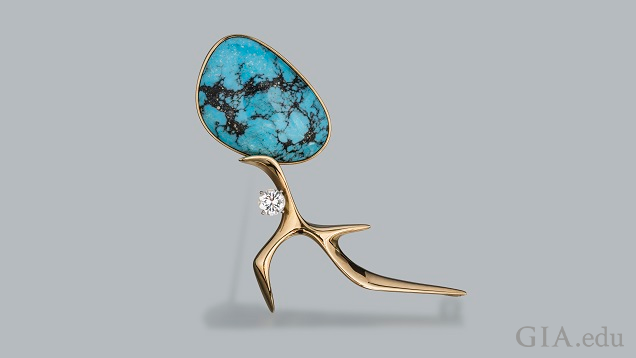 Turquoise’s personality is natural, earthy and traditional. It has been used in jewelry dating back to the earliest recorded history of civilization in many cultures. 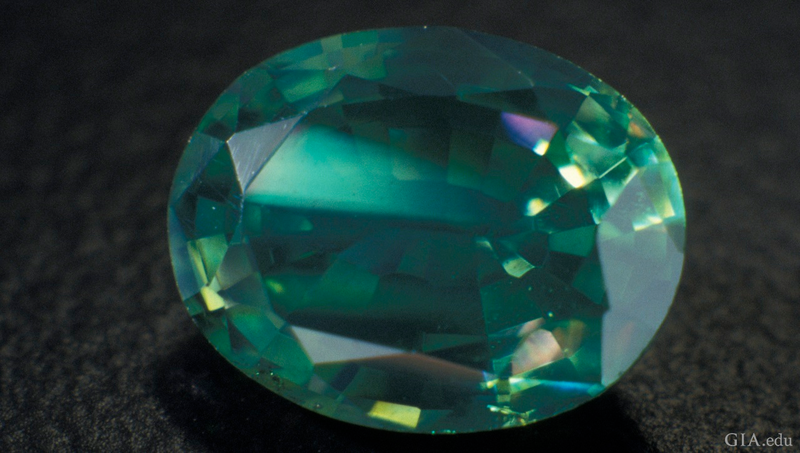 Egyptians preferred the greenish-blue turquoise found in the Sinai Peninsula, which is fortunately resistant to fading when exposed to sun or water. Well-preserved bracelets, pectoral ornaments and scarabs featuring turquoise have been discovered from excavations in Ancient Egypt dating prior to 3100 BCE. Archeologists have also found turquoise ceremonial artifacts in the tombs of Mayan elite in Central America. 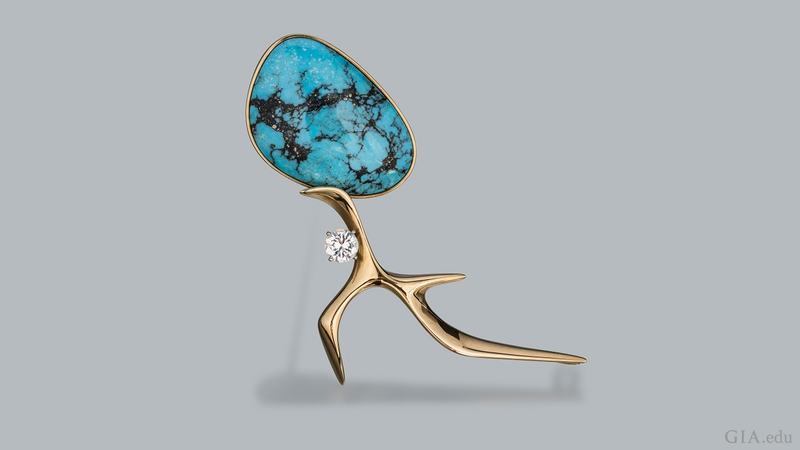 A stunning 13.48 ct Sleeping Beauty turquoise cabochon is surrounded by diamonds and plique à jour enamel, set in 18K gold. Courtesy of Andrew Sarosi. Photo by Robert Weldon/GIA. Turquoise was introduced to Europe in the 16th century as it made its way on the Silk Road from mines in Persia to the bazaars in Turkey. 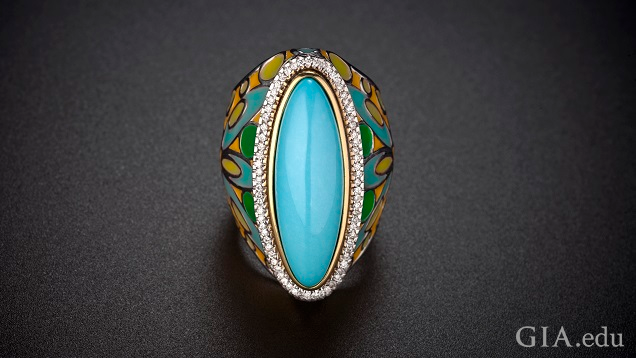 Although many think turquoise material was named for its color, the robin egg blue material from the historic Khorasan province of Persia derived its name from the French turquois for “Turkish” because the mineral was first brought to Europe through Turkey. 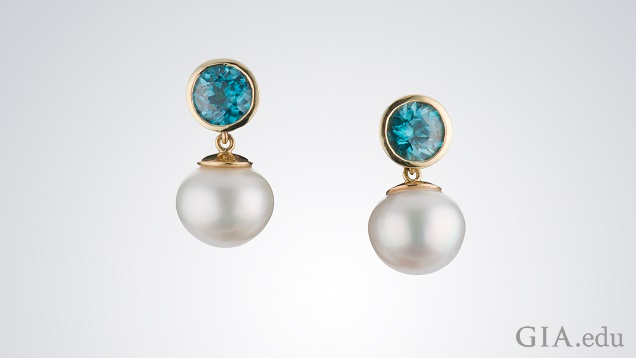 Although the original source has been mined out, fine blue turquoise is still described as Persian blue in the trade today. 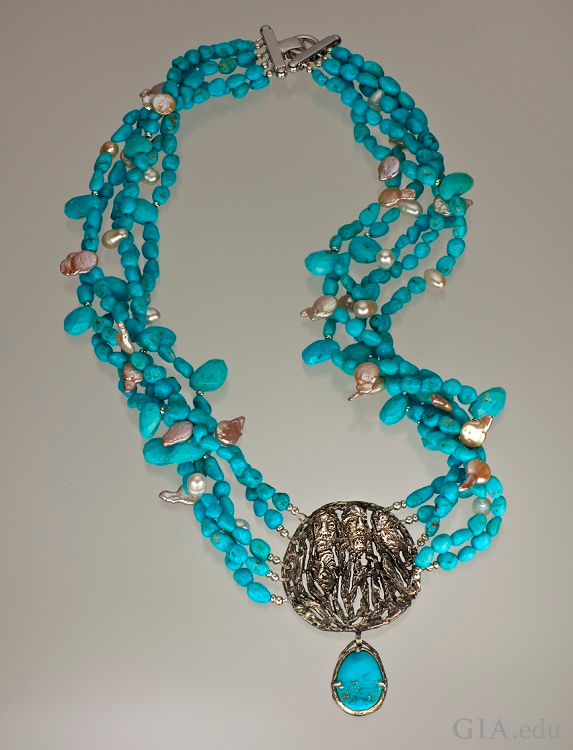 Native American cultures believe the Earth is alive and that turquoise is a living, healing gemstone. The Sleeping Beauty mine in Arizona is known for turquoise with spider web matrix, which is prominent in Southwest Native American jewelry. China is the world’s major source of top color sky blue turquoise. 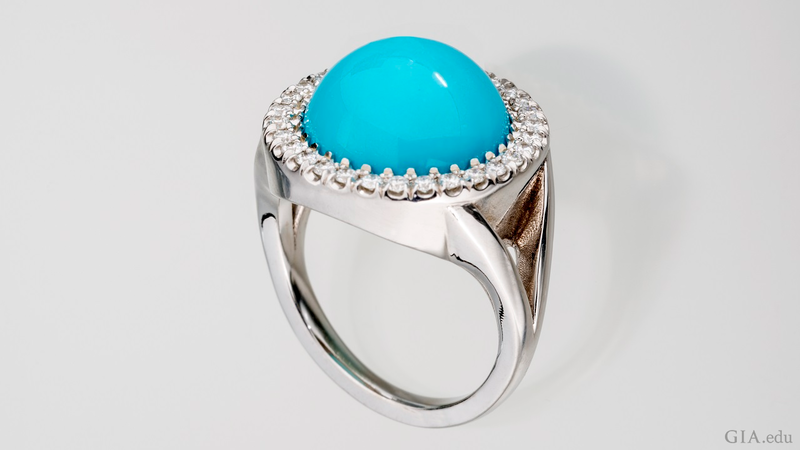 Turquoise is a copper phosphate mineral, which accounts for its opaque blue to green colors. It is found in the Sinai Peninsula, Turkey, China and North America. Zircon’s bright personality is a result of its high refractive index, which gives it excellent brilliance, luster and fire. Its characteristics resemble diamond, so it was used in the 19th century as a diamond alternative. Zircon is colorless when pure. Trace minerals found in the gems produce yellow, orange, blue, red, brown and green colors. 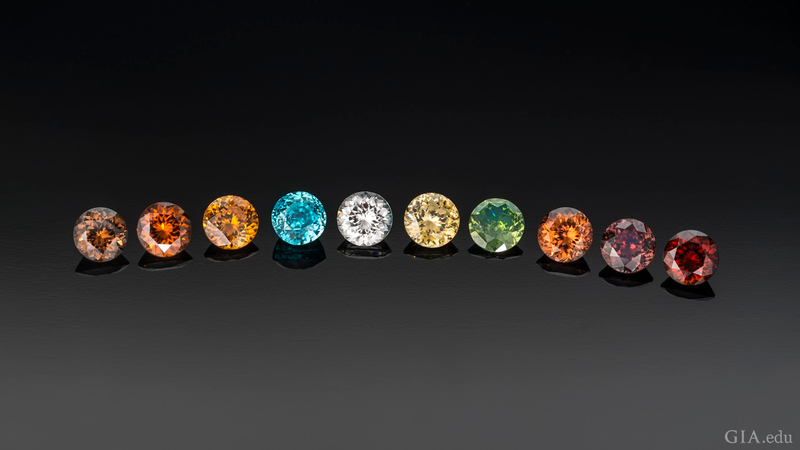 Most rough zircon is brown and can be transformed into colorless and blue by heat treatment. Zircons are classified as high or low zircons depending on their density, hardness and refractive index. Because of its uranium and thorium content, low (metamict) zircon is modified by internal radiation damage. Over time its density decreases; the crystal structure is compromised taking on a lackluster, moody appearance and the color changes. 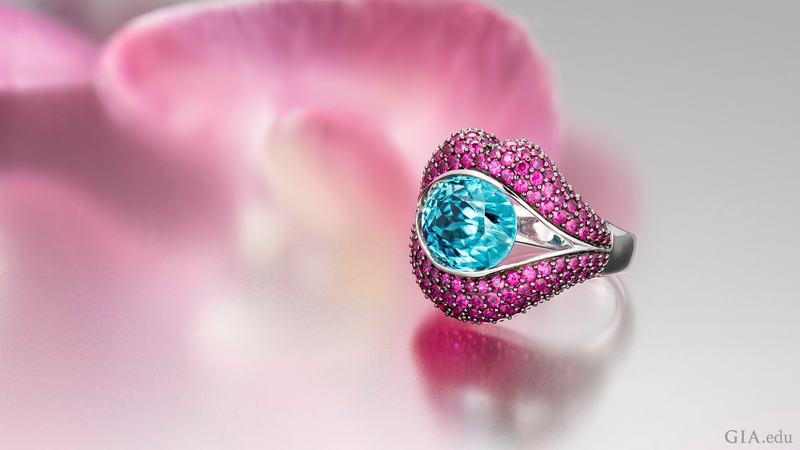 Blue zircon was popular in English estate jewelry in the 1880s and it remains the most popular color with consumers. Zircon is believed to provide the wearer with wisdom, honor and riches. 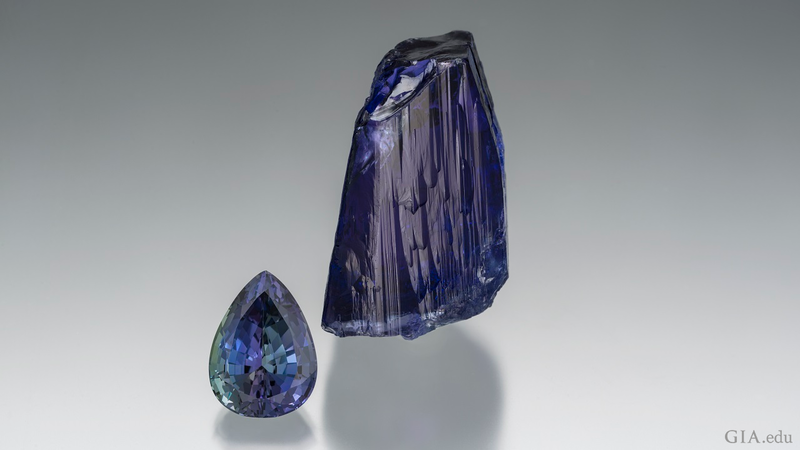 Tanzanite, a modern gem discovered in the 1960s in the foothills of Africa’s Mt. Kilimanjaro, its only source, has multiple personalities. 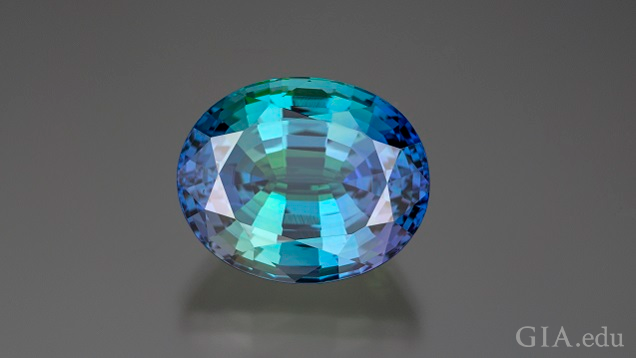 Because of its pleochroism, cutting direction determines the gem’s overall face-up color. When you look at it from one angle it appears blue, but from a different angle it appears purple. Or, if you look very closely and are lucky you may see a third color – red green, orange or brown. 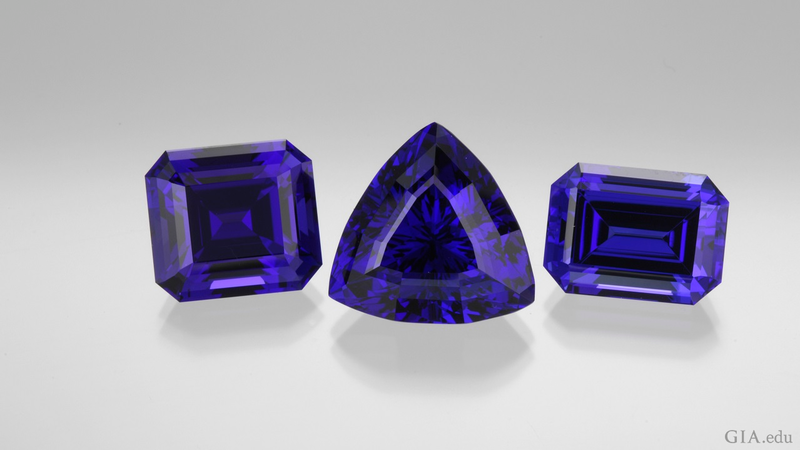 Cutting plays an important role in tanzanite’s color display, so does a prevalent low-heat treatment that modifies brownish zoisite to more desirable violet to blue colors, known as tanzanite. 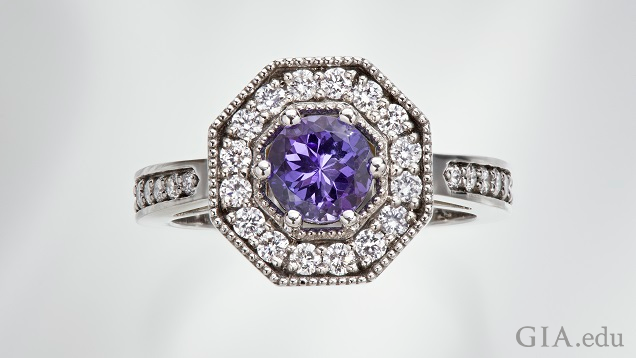 This tanzanite and diamond ring is courtesy of Michelle Loon, GIA GG. Photo by Kevin Schumacher/GIA. Fine tanzanite has a richness and depth of color that is often described as “velvety.” It is one of the world’s most popular gemstones, at times rivaling ruby, emerald and sapphire. Mineral collectors vie for beautiful crystal specimens of natural zoisite in blue, purple, green, yellow, and pink hues. Now that you’ve become acquainted with these December birthstones, you are ready to make an informed birthstone choice for a gift in December – or any time of the year. Sharon Bohannon, a media editor who researches, catalogs and documents photos, is a GIA GG and GIA AJP. She works in the Richard T. Liddicoat Gemological Library and Information Center. Discover the meaning, history, localities and more about birthstones for each month.